While at times tedious and extremely heady, Crawford's work moved and challenged me to rethink "knowledge work" vs. "manual work" or white collar vs blue collar. 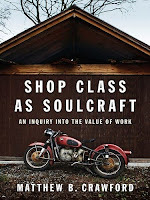 He makes a strong case for manual labor, runs through it's history and weaves his own story as a motorcycle mechanic into the book. I wouldn't necessarily recommend the book, which I doubt I would have made it through if I wasn't listening to it in the car, but I would highly recommend his essay that preceded the book. You can check it out here and it's definitely worth thirty minutes of your time. I read most of the article a few weeks ago, and I think that he romanticized manual labor too much. I thought that it was spoken from the perspective of someone who has the privilege of working with their hands because they like to not because they have to. This is a HUGE difference. True, there is something therapeutic about working with your hands, but it can also be miserable as our bodies break down. At the end of the day it was hard to look past my annoyance with him, but it was interesting to think about. I completely agree with your assessment. There is a difference between the privelegde of manual labor and the I-have-no-other-choice kind of manual labor. No doubt about it.